Can you tell us about this project that has applied for the 2018 Miss.Africa Seed Fund Awards? Africa’s greatest population, being the youngest continent is estimated to have close the world’s population in 20 years’ time while a females make up the greater part of it. But to harness this immerse asset, the African woman/girl needs to be equipped not only with today’s traditional work skills but also with globally competitive technological skills which will enable them to be part of the Future of Work. As the reach of digital technologies continues to rapidly expand, the gap between men and women accessing the internet has widened over the years, hence this project titled “Bridging the Digital Gender Divide for Future of jobs in Africa” addresses this by empowering women with Digital skills training and mentorship. These ladies will be trained in Design Thinking which is a core area of scope which will be thought as a general course. This will aid them in societal problem realization/identification, analysis and best problem solving techniques leveraging on acquired skills. After which they will be specialized in either one or more of emerging technologies like Internet of Things(IoT), Web development, Graphic Design and Machine learning/Artificial intelligence. Upon completion of training program ladies with very good business ideas will be taken through business incubation program to develop their ideas into businesses with a seed fund whiles others will get the opportunity to do their internship and job opportunities with our Industrial partners . These ladies will be nurtured with the mindset to become mentors to other ladies in society. What are some of the challenges you are trying to address with your project? 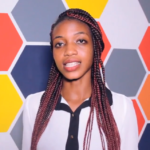 The existing gender gap in Tech related career fields – Bridging the digital gender divide for future jobs in Africa seeks to train ladies in emerging technologies making them ready for the future of jobs. High rates of unemployment in Africa – Africa faces a high rate of unemployment while the few available jobs are moving towards digitization. Getting more ladies into Tech will aid the African woman realize acquired skills in Tech. The entrepreneurship skills acquired will also aid women in beginning their our startups. Inequality and gender discrimination faced by women in Tech– Most women face a lot of challenges when it comes to careers in fields of Tech. They are being considered as not competent for such roles hence they are denied some opportunities and benefits they are entitled to. Poverty in Africa – one way to eradicate poverty in Africa is by empowering the African woman. Most African homes face poverty as a result of low per capita income. Women form a greater part of our current population hence to eradicate poverty we need to identify opportunities in creating jobs. Jobs in tech can be well paying hence getting ladies into such jobs will serve as a source of income to support and improve their living standard thereby reducing poverty rates in Africa. How are you bringing innovative approaches to these problems? What makes our program unique is its strong connected channel of skills development from the grassroots to Entrepreneurship/work to our Easy-to-Grab method of teaching various fields of emerging technology. Our program offers dedicated, comprehensive program aiming at introducing the young African to such 4th Industrial age technologies and skills. We then use design-thinking based Hackathons and maker faire competitions to offer participants the platform and resources to innovate around societal problems to create solutions. We aim at channeling out various solutions, business models and possibly start-ups amongst females based on the core of frontier internet technologies with creativity and innovation. Unlike other training, this program will give participants the opportunity to get practical, innovative and advanced ways of doing things internationally through our partnership with Shenzen Innovative Lab in China hence giving them the exposure of cultural exchange and a ground for social networking . Also this training session will be held on weekdays and weekends of each week to make it flexible for both student and non – student ladies to participate. Besides online publicity for example use class to class and community visits to publicity method this which will help disseminate the information reaching a high number of girls besides even for those who can’t access the internet or could not read sticker or banners. This strategies has been helpful over the past years. How does it feel to gain international recognition for your work? It feels awesome and very exciting to get internationally recognized . This helps promote and open doors to great opportunities in the future and the opportunity open comments and recommendations which helps improve our works and expand our reach and boarders We live in a global village hence if our works aren’t known our impact gets very little on society. Am Sandra Juliet Ahiataku, the project lead for Kumasi Hive, I have worked on a number of STEM projects for girls in Ghana such as the Unlocking Women and Technology Program which seeks to expose ladies to a skill in web development, most of the ladies already have existing business ideas and as part of their project will develop website for their businesses. Again, our Internet of Things Training (Ladies) which also has given the change to ladies to become female makers or Experts in the field Internet of Things (IoT) Technology and build a career path in it. We has also engaged students in basic schools located in the rural areas of the Ashanti and Volta Region of Ghana with science practical lessons helping them appreciate the meaning and applications of science to the real world of which most of these local school pupils trained are girls. We feel honoured to be part of 5 shortlisted candidates for Miss Africa 2018 Seed Fund and we hope for greater opportunities in the future. Can you explain why skills for women in tech is so important? Women Empowerment – this gives the opportunity for women to get empowered and then become financially independent. In most Ghanaian homes and Africa at large, men are the bread winners of most families, women of such homes suffer certain forms of abuses like domestic violence and right to some basic human rights. Exposing women/ladies to Tech can make them financially independent since they can create new jobs through entrepreneurship get jobs that will serve as their form of income thereby improving their standards of living. For the past years Kumasi Hive have trained close to 600 ladies in emerging technology fields and entrepreneurship and about 50 of them have their start ups established. Creation of new jobs and the availability of future jobs to the young African lady – equipping ladies with the right digital skills and mentorship will help create new jobs and give them the chance to fit with existing jobs. Gender diversity benefits companies. Statistics show that Businesses with a woman as the executive team are more likely to have a higher valuation at first and last funding. Improving the digital gender literacy of Africa and closing up the existing gender gap – women trained in Tech are equipped with the digital skills which helps improve their digital literacy. This ladies apply the acquired skills to solve the various challenges of society. What in your opinion should be done to address the digital skills gap in Africa? Education ,Training and mentorship of the current young African population of ladies into Tech – when ladies are educated on the importance and opportunities in Tech , they will become mentors to other ladies who will in turn pass on their acquired skills to the up and coming generation. Right Career guidance and counselling – There is this traditional notion that Tech is a field for guys and a difficult area for ladies to enter into. With the right guidance and counselling, the young African lady will be interested in a career path related to Tech since she will be made known to the avenues that are available and the diverse fields to be explored as a female in Tech. Creation of an enabling environment that supports the learning of IT – With an enabling environment that provides the young Africa lady with the necessary needs like free internet access since it is a powerful tool for research and ICT infrastructure such as ICT centres in our various schools and local communities for the African woman/girl can assist them to learn skills and put them into practice . Rethinking the Basic school educational curriculum making ICT compulsory subject to study in basic all basic schools. When ladies get introduced to IT at young ages, it makes them appreciate and understand better its use and application. They develop the habit of exploring on their own. Sandra Juliet Ahiataku, Kumasi Hive, Ghana. 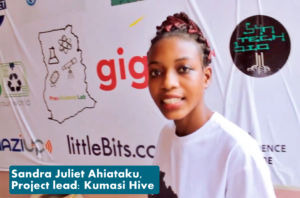 Ms. Ahiataku is the project lead for Kumasi Hive, She was worked on a number of STEM projects for girls in Ghana such as the Unlocking Women and Technology Program which seeks to expose ladies to a skill in web development. Kumasi Hive is Co-founded by CEO Jorge Appiah; it is a multi-space innovation place for rapid prototyping of ideas, budding local innovations, impact start-up support and promoting youth entrepreneurship as a way of addressing critical social economic and developmental challenges.